Pink is pretty and when combined with white looks prettier. Our White Roses and Pink Roses Basket is a lovely combination of two gentle pure colors. 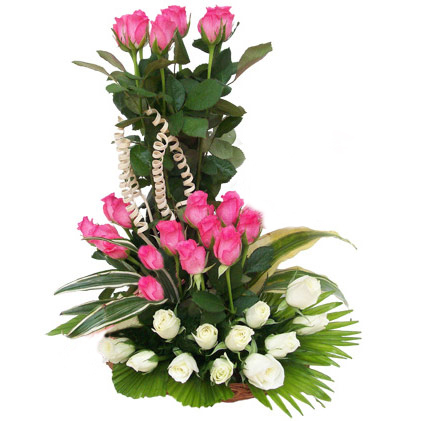 Our florist has tastefully combined 40 White and Pink Roses in a basket along with greenery to make it more appealing. The sweet smelling fresh roses are sure to win someone’s heart. The White and Pink Roses Basket makes a loving Mother’s Day Gift, you can also send it on father’s day. Send roses bouquet online to your friend and show how much you care. You can also send flowers basket to the person you admire or are fond of.